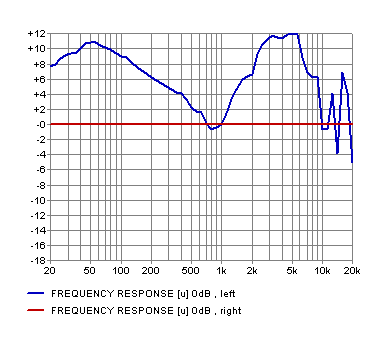 Very comfortable headphones with quite impressive sound, but the frequency response plot shows a rather flawed result, which can be seen as essentially balanced but for an 8dB dip in the middle. Listening tests confirm a bass-heavy sound, which is less apparent than would otherwise be the case because of the raised high end. Attenuated high frequencies in the 5k to 10k region are normal for headphones to compensate for the HRTF difference between frontal and side presentation, but a hole in the middle is not (see Sennheiser HD650 for comparison - the latter have a much flatter mid-range response. Tested using an in-ear mike on an earplug (blocked meatus) to avoid ear canal resonance.